Doug Brown is the new Director of 911 Communications for Routt County. I wish him well and hope he serves ALL of the citizens of Routt County well. I also wish Mr. McMenamin well. I hope he seeks treatment for whatever it is that ails him. Freedom of speech is a fantastic thing. Proper usage of free speech can be beneficial. Improper usage can be dangerous, hurtful, or possibly even deadly...(possibly) depending on your political affiliation...and (possibly) depending on whom you may have to rely on for emergency care. 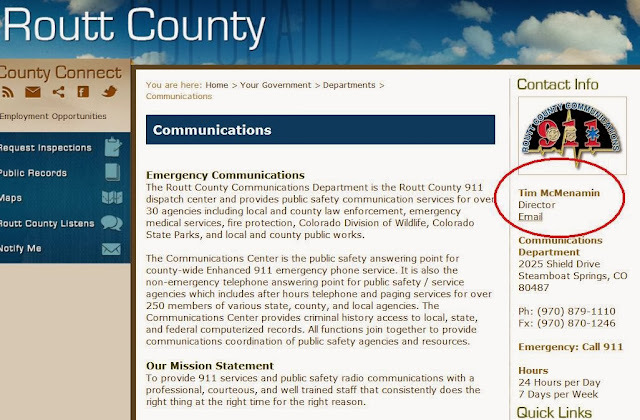 The $110,000/year (including benefits) 911 Communications Director for Routt County in Colorado, Tim McMenamin, has a problem. 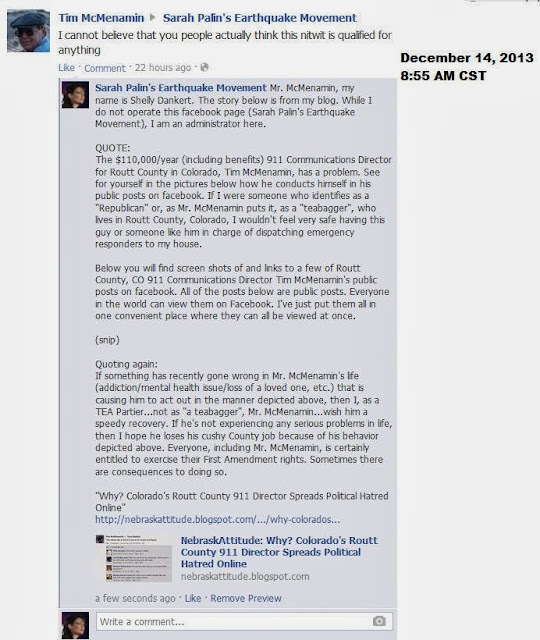 See for yourself in the pictures below how he conducts himself in his public posts on facebook. If I were someone who identifies as a "Republican" or, as Mr. McMenamin puts it, as a "teabagger", who lives in Routt County, Colorado, I wouldn't feel very safe having this guy or someone like him in charge of dispatching emergency responders to my house. 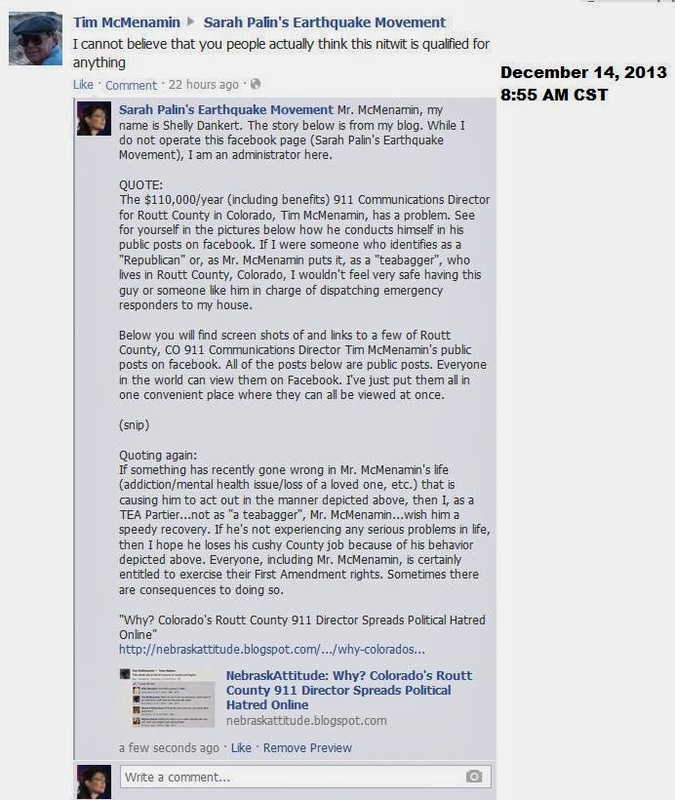 Below you will find screen shots of and links to a few of Routt County, CO 911 Communications Director Tim McMenamin's public posts on facebook. All of the posts below are public posts. Everyone in the world can view them on Facebook. I've just put them all in one convenient place where they can all be viewed at once. Tim McMenamin has his job listed on his facebook account. Mr. McMenamin is a public County employee in Colorado. I will demonstrate for you below that Mr. McMenamin exhibits questionable behavior (putting it mildly) for any County employee. 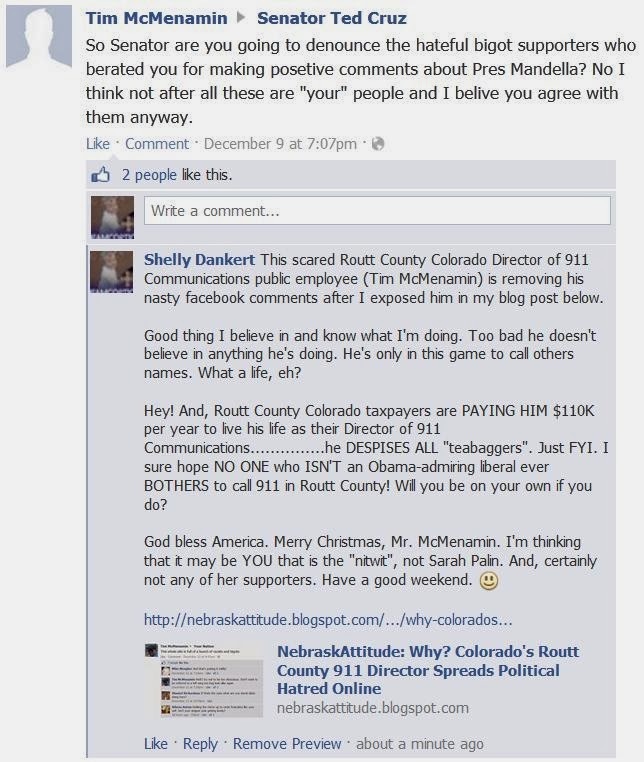 Some taxpayers in Routt County, Colorado may react negatively to paying the $110K salary (including benefits) of someone who behaves as poorly as Mr. McMenamin. SEE BELOW. This is the comment that first introduced me to Mr. McMenamin. I'm a member and an administrator of the Sarah Palin's Earthquake Movement Facebook page. That comment from Mr. McMenamin wasn't that bad. I've seen (and personally received) much, much worse. When lower case letters just won't do...immediately re-post your own comment in ALL CAPS. Some more tolerance...posted during work hours again. (Link to comment) (Link to Tea Party Leadership Fund Facebook page) I'm guessing that while an overpaid county employee is in the throws of a foaming-at-the-mouth tantrum, taxpayers would be asking too much to expect proper spelling of even the most simple of words. If something has recently gone wrong in Mr. McMenamin's life (addiction/mental health issue/loss of a loved one, etc.) that is causing him to act out in the manner depicted above, then I, as a TEA Partier...not as "a teabagger", Mr. McMenamin...wish him a speedy recovery. If he's not experiencing any serious problems in life, then I hope he loses his cushy County job because of his behavior depicted above. Everyone, including Mr. McMenamin, is certainly entitled to exercise their First Amendment rights. Sometimes there are consequences to doing so. Mr. Tim McMenamin has removed his profile picture and his place of employment (among other information) from his Facebook account. As you can see, he has yet to de-activate his Facebook account. He's just hiding some of his personal information from being displayed on his Facebook account. As you can see in the pictures of his account (at the top of this post), he listed his employer as "911 Director at Routt County 9-1-1". He "studied at George Washington University". He "lives in Hayden, Colorado". And, he's "from Philadelphia, Pennsylvania". Good thing I took screen shots, eh? Can't remove or change those, Mr. McMenamin. Sorry. Because Mr. McMenamin is removing many of his Facebook comments that are depicted above, I'm now able to see other comments he posted that I previously missed. 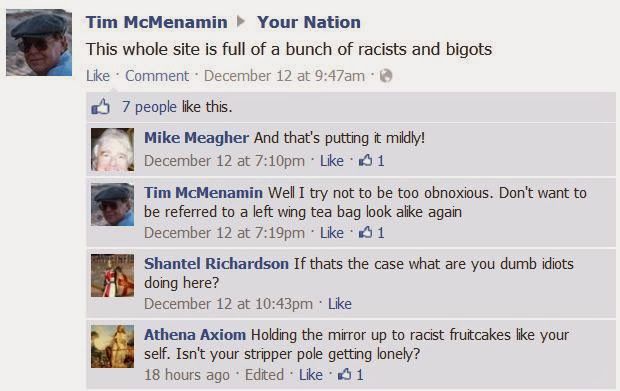 The bigoted Tim McMenamin has now removed his "bigoted teabaggers" comment from "Stop Amnesty's" timeline. I wonder what it feels like to an adult male to have to run all over a website and remove comments you made? I never say anything I don't believe, therefore, I stand by EVERYTHING I've said in the past. I may wish I'd said a couple things differently, but I'll never abandon the intent of a comment/video/post I've made. I wonder WHAT is rushing through the mind of Mr. McMenamin? He's certainly scurrying about trying to "fix" what he's done (to no avail). I have screen shots of much of what he's already posted on Facebook. They'll exist in perpetuity. 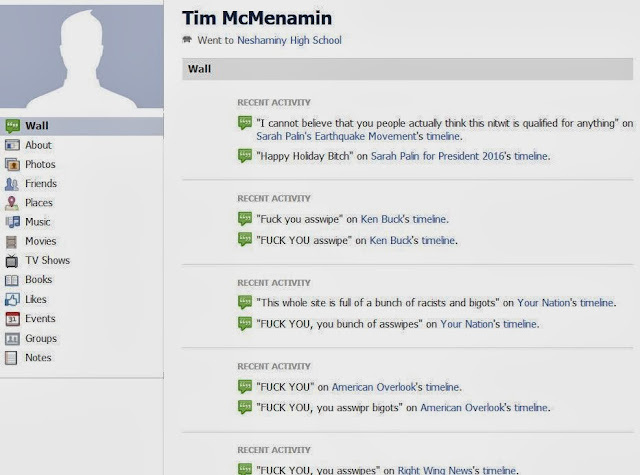 Since Mr. McMenamin removed his comment from our Sarah Palin's Earthquake Facebook page, I had to find another way to contact him (I'll keep his government email address, and that of his superiors, as a last resort). "Thank you so much for this information. You can rest assured that I have forwarded this information along with my comments to Mr. McMenamin’s supervisors who happens to be the Board of County Commissioners and County Manager Tom Sullivan. This is very disturbing and we will get to the bottom of this. "The Routt County Communication Department is not affiliated with or supervised by the Routt County Sheriff’s Office (RCSO). The RCSO has policy and procedure that addresses this kind of ill behavior and is not tolerated." I should also state that County Manager Tom Sullivan is one of the 11 people within Routt County government whom I emailed this morning. I wanted to note that Sheriff Wiggins is the only one from whom I have received a response. I will continue to update this post should any further information become available to me.